A quick look at the long-term chart of the U.S. dollar index suggests that the currency is ridiculously overbought, as interest rate hike expectations have actually been priced in since early 2014. Around that time, the Fed had already started unwinding their stimulus program by tapering asset purchases, putting them on track towards eventually increasing borrowing costs. The U.S. dollar has added a few more gains this year, breaking out from a short-term triangle pattern and enjoying renewed bullish pressure in the past couple of months. 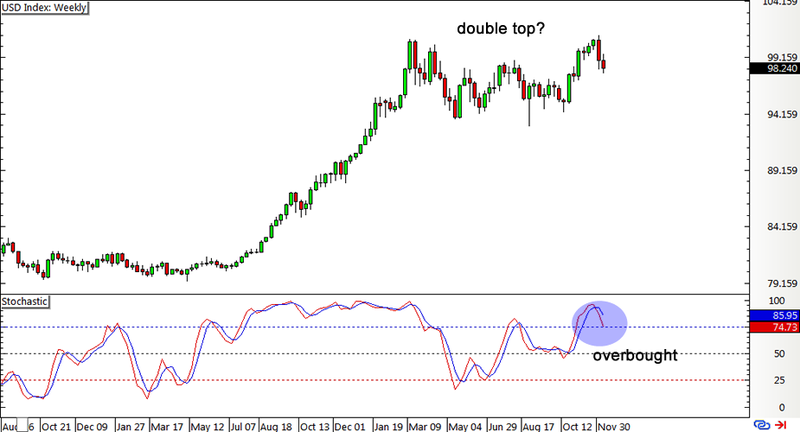 However, it appears to be having trouble breaking past this year’s highs, creating a double top pattern while stochastic is indicating overbought conditions. As I’ve shared with y’all in my central bank events roundup last week, the forex market reaction to certain monetary policy changes haven’t been so straightforward these days. Case in point: The ECB decision to extend their QE program by half a year and lower deposit rates deeper into negative territory was followed by strong rallies among euro pairs. A few days later, the RBNZ’s interest rate cut announcement also yielded hundreds of pips in gains for the Kiwi. One good explanation for this type of price movement is that forex traders have already priced in their expectations for these policy decisions months ago, pushing currencies in prolonged trends even before the actual announcements confirmed their biases. And once the decision turns out as expected, those who’ve caught the longer-term trends take it as a cue to go “Ha! I knew it!” before booking profits, triggering a sharp reversal in the process. Aside from profit-taking, another factor that can spark a turnaround is the central bank’s future monetary policy plans. Yep, forex players are pretty excited to price in their updated expectations for the next rate statements! Take the latest RBNZ statement, for example. While the central bank cut interest rates by 0.25%, Governor Graeme Wheeler also hinted that they’re not looking to ease again anytime soon since he shared a much more upbeat growth outlook for next year. In the ECB’s case, part of the euro’s forex gains could also be attributed to the central bank’s unchanged GDP estimate for next year and its upgraded growth forecast for 2017. As for the FOMC, any hawkish action could be accompanied by very cautious remarks, reiterating that their tightening cycle would proceed in a slow and gradual pace. Heck, I wouldn’t be surprised if Yellen says something about wanting to wait much longer before hiking interest rates again or being willing to undo any tightening moves if the economic situation worsens in the coming months. Y’all know how she loves to keep market expectations in check!